The Bhutia (in Sikkim: Denzongpa; Tibetan, Wylie: 'Bras-ljongs-pa; "inhabitants of Denzong;" in Bhutan: Dukpa) are a community of people of Tibetan ancestry, who speak Sikkimese, a Tibetan dialect fairly mutually intelligible to standard Tibetan. In 2001, the Bhutia numbered around 70,300. Bhutia here refers to Sikkimese of Tibetan ancestry; in contrast, the Bhotiya are a larger family of related Tibetan peoples in northern Nepal of which the Bhutia are one member group. The traditional outfit of Bhutias is called a bakhu (similar to the Tibetan chuba, but sleeveless) which is a loose cloak type garment that is fastened at the neck on one side and near the waist with a silk/cotton belt. Male members array the bakhu with a loose trouser. The womenfolk don the bakhu with a silken full sleeve blouse called honju; a loose gown type garment fastened near the waist, tight with a belt. In the front portion a loose sheet of multi-coloured woollen cloth with exotic geometric designs is tied. This is called the pangden and is a symbol of a married woman. This traditional outfit is complemented by embroidered leather boots by both men and women. Bhutia women enjoy a much higher status than their counterparts from other communities. Both women and men have a special weakness for gold in its purest form and, traditional jewellery is mostly made of 24 carats (100%) gold. Kho (Bhutia) or Bakhu (Nepali) is a traditional dress worn by Bhutia, ethnic Tibetans of Sikkim. It is a loose cloak type garment that is fastened at the neck on one side and near the waist with a silk or cotton belt, similar to the Tibetan chuba, but sleeveless. Women wear a silken full sleeve blouse called honju inside the kho; a loose gown type garment fastened near the waist, tightened with a belt. Married women tie a multi-coloured striped apron of woolen cloth called pangden around their waist. 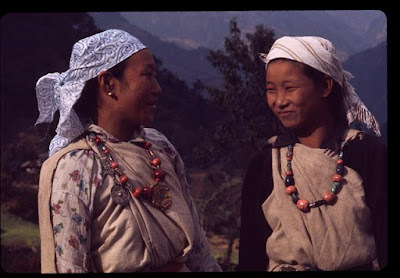 the aboriginal people of Sikkim, who number between 30,000 and 50,000. Many Lepcha are also found in western and southwestern Bhutan, Tibet, Darjeeling, the Ilam District of eastern Nepal, and in the hills of West Bengal. The Lepcha people are composed of four main distinct communities: the Renjóngmú of Sikkim; the Támsángmú of Kalimpong, Kurseong, and Mirik; the ʔilámmú of Ilam District, Nepal; and the Promú of Samtse and Chukha in southwestern Bhutan. 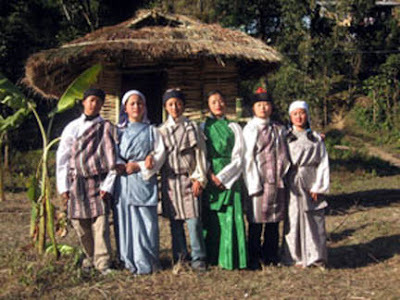 The traditional Lepcha clothing for men is the dumprá ("male dress"). It is a multicolored, hand-woven cloth pinned at one shoulder and held in place by a waistband, usually worn over a white shirt and trousers. Men wear a flat round cap called a thyáktuk, with stiff black velvet sides and a multicolored top topped by a knot. Rarely, the traditional cone-shaped bamboo and rattan hats are worn.